MANHATTAN — Upper West Sider Jennifer Maguire works from her apartment's second bedroom three days a week. On other days, she sets up shop at co-working spaces in her neighborhood or at other locations that might be near client meetings since Maguire — who runs her own small public relations firm — believes "changing your environment can change your mindset." Maguire is part of the city's expanding economy of office workers who do their jobs at home or elsewhere outside of a traditional office. The real estate industry is paying close attention to this workforce. Many developers are building co-working spaces in new (and sometimes older) residential projects, while co-working companies with monthly memberships, like WeWork and the Yard, are snatching up commercial spaces across the city. The Upper West Side has the city's largest population of people who work from home, according Census data from 2009 to 2013 compiled by DNAinfo. It was followed by the Upper East Side, the West Village and the Hudson Yards-Chelsea-Flatiron area in Manhattan. In Brooklyn, the top areas were Park Slope-Gowanus, the north and south side of Williamsburg and Borough Park. In Queens, Forest Hills led the way, followed by Astoria and Jackson Heights. There isn't a lot of demographic data that the Census collects on this workforce, but according to national numbers, people who work from home skew older, whiter, male and more affluent, according to 2010 Census data, said Heidi Learner, chief economist at commercial real estate firm Savills Studley. Roughly 27 percent were 45 to 54 years old in 2010. More than 51 percent were male; 87 percent were white and approximately 50 percent of them earned $100,000 a year or more. In the New York City region overall, the percentage of people who worked from home grew by nearly 18 percent from 2005 to 2010, said Learner, citing Census data. Many experts believe the numbers are only increasing. "There's a growing number of people working in spare bedrooms," said Richard Greenwald, a Brooklyn College professor and the author of the forthcoming book "The Death of 9-5: Permanent Freelancers, Empty Offices and the New Way America Works." "The days of café sitting — when you could just camp out at cafés — is over," he added. "A lot of the smaller cafés are too crowded or out of business, and Starbucks is way overcrowded. You can't be guaranteed a space there. So more people are turning to co-working spaces." 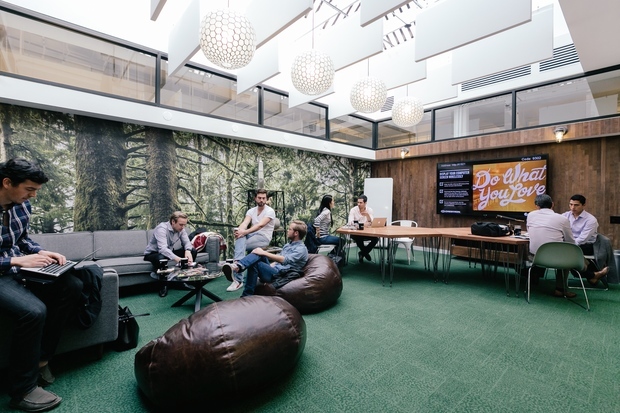 Co-working spaces have leased more space than any other industry in the last few years, said Savills Studley Senior Managing Director Evan Margolin, adding, "I don't see any signs of it slowing down." Margolin helped the Yard find space for its fifth New York City location, which is expected to open in Herald Square in September and just helped it ink a lease for a 33,000-square-foot building in the Flatiron (around the corner from one of its existing spots), which is expected to include office suites and co-working spaces for 450 people, an event space for 150 people, a rooftop garden and a full service "gentlemen's grooming club." "The demand [for co-working space] is not going away," said Andy Smith, director of operations of the Yard. "All signs point to more entrepreneurialism and more independence in the workforce." People need a space where they can close a door and "get things done," he said, adding that the Yard's roughly 1,000 members have also asked for nap pods and meditation rooms. WeWork, which has 14,000 members in New York City at its 15 locations, seems to be expanding at a clip, with new 90,000-square-foot space at 81 Prospect Dumbo Heights opening in August. Known for having beer on tap at its co-working spaces, WeWork promotes the ways in which its spaces foster a sense of community, the company's vice president for business development Matt Shampine said. Besides fostering social interactions like this summer's weekend "camp" in the Adirondacks for 1,500 members, WeWork also helps its members get discounted rates on health insurance or credit card processing, Shampine noted. Both residential developers and companies with offices are also modeling their spaces on the co-working facilities, experts noted. "This year, it's all about, 'give me a workspace [in the building] where I can work from home or a floor plan flexible enough where I can do it,'" said Charlie Lewis, of Warburg Realty, who is working on a new development with 82 one-bedroom units in Harlem at 305 W. 150th St. where the entertainment space will also have a communal table for people to do their work. "Fortune 500 companies are organizing their offices like co-working spaces," Greenwald noted, to create more areas to promote collaboration — and to accommodate an ebb and flow of staffers who only come into the office on occasion. "Sometimes as many as 30 to 40 percent of the workforces is not always in, but sometimes they are." Having more employees work from home helps companies cut down on real estate costs, which is the second largest expense after salary and benefits, Learner said. Maguire has learned how to cut down on distractions while working from home. For instance, she has a self-imposed ban on doing laundry during the workday and eats at her desk so she doesn't "get caught in the black hole of the kitchen." Since her home office also functions at her guestroom, she's strict about visitors being out by 8 a.m. so she can start working with her three part-time employees, who communicate by email, phone, gChat and HipChat. And she dresses for work every day. "If your uniform is pajamas, you are going to do pajama-level work," Maguire said. "Home office attire should be presentable at best."